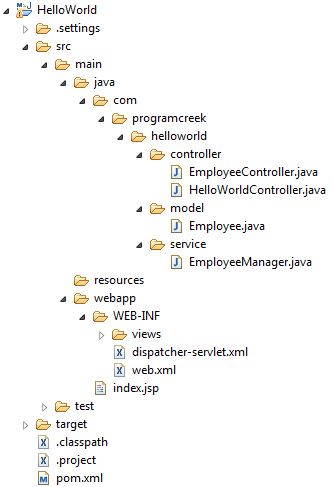 In previous tutorial, we have seen how to create a simple Hello World Spring application using Maven under Eclipse. In the Hello World application, we used annotation. In this tutorial, I will show how to use xml configuration and setter dependency injection. Instead of showing a message in the final view, this time it shows a list of employees. Create another view file - employeeList.jsp under the views directory. Running the project, we will get the views. dependency injection is not used in this tutorial. you define the bean “employeeManager” in dispatcher-servlet.xml file but you didn’t used in the controller in the handleRequest method.